Ten minutes of pilates style moves targeting the glutes to give you a toned and lifted booty fast! Beki was a showgirl from the start! After a few tours of duty performing high kicking cabaret on cruise ships around the Caribbean, Beki returned to her home town of Bolton where she started teaching successful Zumba and Dance classes to young and old. Beki then added high intensity to her resume and started packing out sports halls. Beki joined Beachbody in 2014, and quickly rose through the ranks hitting the top 5 Master Trainers worldwide in 2015. 2016 bought with it some big changes, with Beki founding not only her own gym (The Fitness Room) but also her family – her daughter Hattie is the youngest SH1FT Team Member! 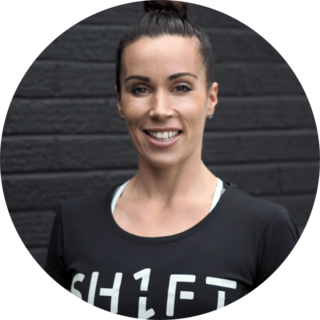 Beki has been with SH1FT from the very beginning as a founding Master Trainer and continues to be an inspiration to everyone who attends her classes. You can follow Beki on Instagram here.